Can you imagine this man in the White House? The idea of Mitt Romney in the White House is a scary, scary thought after his bungling of the Libya crisis, and the Stormin’ Mormon just keeps making it scarier—including putting out Liz Cheney as spokeswoman for his anti-Muslim bigotry. 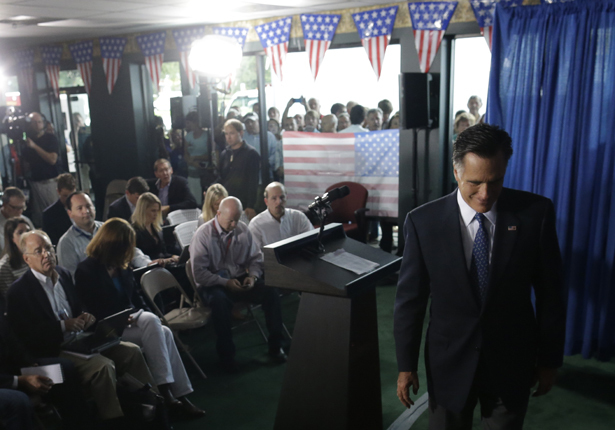 The question I’d like to hear reporters ask Mitt, if they ever get a chance to get within 100 yards of him, is: “OK. You’ve condemned the extremists who killed the ambassador. You blasted the State Department for its statement urging respect for all religions, including Islam. Now, will you criticize the extremists who made the film that sparked the crisis?” So far, not a word from Romney about radical right Christian anti-Muslim bigots, including: Florida’s Terry Jones, the nutball, Koran-burning preacher who promoted the film; various extremist, Egyptian Copts; Steve Klein of California; and the mystery man who supposedly made the film. General Martin Dempsey, chairman of the Joint Chiefs, even placed a call to Jones to try to shut him up. Two years ago, then–Secretary of Defense Robert Gates had to call him, too. I worry that if Romney called Jones, he’d egg him on. The Lede Blog at the New York Times has a wonderful summary of the crackpots behind the YouTube video that triggered the crisis, including a pretty good rundown of the odd cast of characters behind it, and Adam Nagourney in the Times writes about Steve Klein. It’s easy to poke fun at the crazies who made the film, even while expressing horror at the damage it’s touched off: attacks on US embassies in Libya, Egypt, Yemen and Tunisia, so far. But the real issue, still, is Romney. At a news conference, Mr. Romney claimed that the administration had delivered “an apology for America’s values.” In fact, it had done no such thing: Religious tolerance, as much as freedom of speech, is a core American value. The movie that provoked the protests, which mocks the prophet Muhammad and portrays Muslims as immoral and violent, is a despicable piece of bigotry; it was striking that Mr. Romney had nothing to say about such hatred directed at a major religious faith. I think it’s a terrible course for America to stand in apology for our values, that instead when our grounds are being attacked and being breached, that the first response of the United States must be outrage at the breach of the sovereignty of our nation. An apology for America’s values is never the right course. Of course, need it be said that neither President Obama nor anyone in the administration apologized for anything. And is Romney saying that “America’s values” are upheld by the crackpot critique of Islam from Klein, Jones et al.? They clearly—they clearly sent mixed messages to the world. And—and the statement came from the administration—and the embassy is the administration—the statement that came from the administration was a—was a statement which is akin to apology and I think was a—a—a severe miscalculation.